I have been waiting forever to see this. I got my book cover. It feels like a real book now. 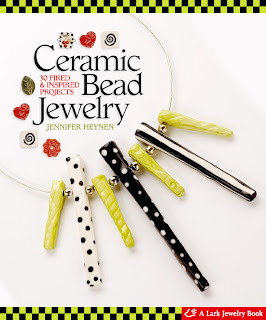 I have been working on my Ceramic Bead Jewelry book for over a year now,and it's so nice to something physical. I have learned so much about the process of writing books this year. First off all, I wrote the words and designed and made the projects and was on hand for the photo shoot. Actually, you'll get to see my lovely manicured hands in the book. They never look that good but for a book they have to. Ooops, I got off track here. This is what I am getting at. The author, most of the time has no control of the layout, look, or cover of the book. This is all in the hands of the editors and art directors. This of course is a scary thing since I am a control freak. But then again, I bugged and bugged Lark Books about publishing a ceramic bead book for this exact reason. I love every book they put out. The photographs are always wonderful and plentiful. They are always stunning books. I am thrilled with the way my book looks, I never could have made it look so good myself. Lark Books Rock!!!! Just in case you are wondering, my book will be out June 3rd. Yipee! By the way....the new header on the blog matches my new website that will debut in January. It is freakishly similar to the cover of my book. I had no idea of what the cover would look like when I was designing the web stuff.